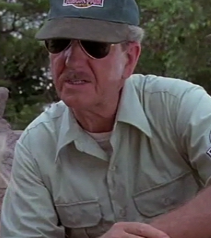 The chief veterinarian at Jurassic Park, Dr. Gerry Harding made sure all the dinosaurs remained healthy and when one became ill, he was on hand to treat it. He was first seen treating a sick Triceratops. With paleobotanist Dr. Ellie Sattler’s help, he was able to diagnose the animal’s condition. Apparently it had eaten a poisonous plant called the West Indian Lilac and became ill, despite his previous belief that the dinosaurs didn’t eat them. Later, Dr. Harding drove Ellie back to the visitor’s center in his gas-powered jeep. Dr. Gerry Harding was played by Gerald R. Molen, who was also one of the film’s producers. He then reappeared with with his daughter, Jess overlooking the Triceratops enclosure. While driving Jess to the dock to take her to the airport home, he ran into Nima Cruz and treated her wounds. They got to the Triceratops enclosure only to discover that the gate was open and Bakhita, a Triceratops calf, had escaped. While he and Jess attempted to get Bakhita back in, Lady Margaret, a large Triceratops alpha charged the gate, trapping Gerry and propelling the jeep, with Jess inside, into a rock wall. As Gerry was trapped, a T. rex came with Gerry and Jess barely escaping as it fought Lady Margaret. In the morning, Laura Sorkin hacked the Park system and sent a tour vehicle to pick up Gerry and Jess. With Nima, it took them to the Visitors’ Center where they talked to Dr. Sorkin over radio. Listening to her, Gerry sent Jess to get tranq darts from the tour vehicle to help treat Nima only for the T. rex to appear again. In the encounter, Gerry successfully treated Nima and with Sorkin’s help, lured the T. rex away with the tour vehicle. On returning to Nima in the center, she pulled a gun and held the Hardings hostage. Later, at a rest stop on the way to the coast, Gerry distracted Nima long enough for Jess to contact Billy Yoder and his team who had arrived to rescue them. Nima then led Gerry and Jess to the Boneshaker Rollercoaster which had replaced a mountain road to the coast that Nima knew. With Nima’s help, Gerry activated the coaster hoping to get to the bottom but a group of Herrerasaurs appeared and in the attack, the coaster was damaged and only with Yoder’s help was Gerry able to save Jess who had found them by spotting the fire smoke. At the helicopter, Gerry once again escaped the T. rex. At Sorkin’s lab, Gerry helped her with the Parasaurolophus only for their work to be interrupted by a pack of hungry Velociraptors. Gerry escaped up the water tower and after witnessing the chopper crash, managed to fix the ladder and ran to the tunnels underneath the park. Gerry later had to fight off the same raptors when Jess unintentionally let them in. The raptors backed off thanks to Oscar Morales and the group reached the geothermal plant. Gerry helped fix the plant, preventing an explosion but only escaping from the raptors thanks to Oscar’s sacrifice. Gerry, along with the others, escaped the raptors in a room for maintenance staff only to discover the Troodon nest and the body of D-Caf which was home to the pack’s eggs. Soon, the room came under siege and Gerry escaped to the tunnels again and ascended an escape ladder to the surface to escape the Troodon. Here, Nima told him her history and together in the damaged tour vehicle from earlier, reunited with the others at the marine facility. After gaining access to the lower level, Sorkin locked herself in and released a mosasaur to try and deter the military from bombing Isla Nublar. It killed her and Gerry, Nima and Jess were trapped after Yoder detonated a grenade. Thanks to Jess’s diving skills, Gerry and the group swam to a cave entrance and trapping the mosasaur. At the docks, Gerry was hit over the head by Yoder and as Nima and Yoder fought, Gerry noted the sound of footsteps. Soon enough, a T. rex came and to test Yoder’s loyalty, Gerry kicked the can toward the water and sadly, Yoder’s greed got the better of him and he was eaten. Gerry took off, and distracted the T. rex, allowing Jess and Nima to escape. In order to stop it eating Jess, Gerry smacked it’s leg with a metal pole, angering the T. rex. It chased him into the container area and after a lengthy confrontation, Gerry ran down a docking area to escape the T. rex, narrowly escaping its jaws. Depending on the ending, Gerry either announces he is moving back to his old job in Dallas and helping the deceased Nima’s daughter or discovering the money with Jess and Nima. 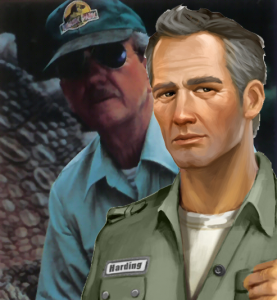 In Jurassic Park: The Game, Dr. Gerry Harding was voiced by Jon Curry.